The tides are turning in Sydney and it’s finally getting hot again. After what felt like a very cold winter, we of the land of surf and sea have been counting the days till summer returns. Now, when I say it felt like a cold winter, it didn’t snow at all or rain too much, and it never got close to zero, but for Sydney-siders it was chilly (laugh at us if you will). With warmer days upon us, and a rather warm Saturday recently, I was excited to bust out my popsicle moulds which I had purchased in the height of winter – you have to be prepared for all last minute recipe ideas as a food blogger. I recently bought a container of gorgeous edible flowers at the Orange Grove Market from the wonderful team at Darling Mills Farm. The purchasing of edible flowers and micro herbs had long been on my mind, but I just hadn’t had the opportunity to get to Orange Grove. This led to a rather impressive over-purchase of micro chard, micro watercress, micro salad leaves, pea tendrils and edible flowers (carried away much?). So after making a couple of great dishes which will soon feature on the blog, I found myself with an abundance of wonderful micro herbs and edible flowers left over. After a short time in the fridge I knew that if I didn’t use the remaining gorgeous edible flowers soon, I would be left with rather sad petals, so it didn’t take long for me to formulate a cunning plan, one which would use all the flowers in a way that showcased their beauty while letting me use one of my new popsicle moulds. 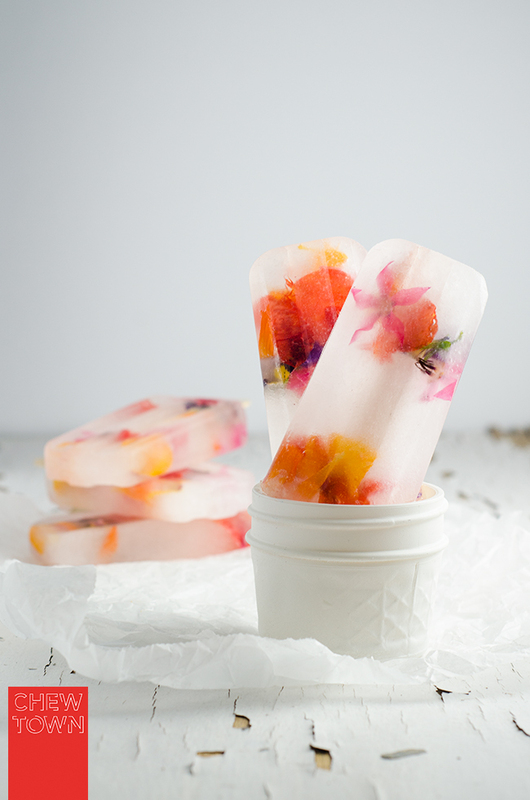 But I couldn’t just freeze the edible flowers in water, I needed to create a delicately flavourful popsicle that married with the beauty of the edible flowers. This is when I quickly remembered I had a bottle of elderflower cordial sitting in the cupboard just waiting for its perfect moment to shine. I definitely am a ‘purchase-items-as-I-see-them’ and not ‘as-I-need-them’ type of person. It means I don’t often have to go out looking for that ‘special’ item. It also means I reach the end of my pay packets more quickly than most as I rapidly fill up my pantry and ‘blog room’ with props and food supplies. The delicate flavour of the elderflower cordial worked perfectly with these popsicles. They looked so beautiful and were a lot of fun to eat. Also, it meant we got to enjoy the gorgeous flowers without having to see sad and droopy petals. Place petals inside the popsicle moulds being sure to layer them on top of each other and not compact them. Mix water and elderflower cordial in a large jug and stir well to combine. Gently pour the cordial mixture into the popsicle moulds trying not to unseat the petals too much. Insert popsicle sticks and place in the freezer until frozen solid. To remove from the moulds gently place bottom of moulds in warm water until the popsicles pull free. They are so pretty! I’d love one of these on a hot sunny day. Recent Post: Changing menu items and pricing – what are your thoughts? Stunning absolutely stunning Amanda! They look so pretty, summery and I would be happy to be cooled on a hot summer (or spring) day with one, or two. These popsicles are just gorgeous – almost too pretty to eat! These are so pretty it hurts. Yay for warmer days! Love these popsicles! They’re gorgeous. It’s still warm here, but it’ll be cold soon enough. I’m looking forward to cooler weather, but not the frigid winter many are predicting. But we’ll see whether they’re right about that! Fun post – thanks. these are so pretty! hurry up summer! Just stunning and such a good idea! After watching our northern hemisphere bretheren celebrate warm weather with cocktails and iceblocks, it is definitely our turn! What a fantastic idea! These are so pretty!! These are just so gorgeous – they’re too pretty to eat! These are ridiculously gorgeous. I love the colours and the flavours. You have blown my mind! Geez girl when are you going to get published? These are drop dead gorgeous! How stunning are these?! Wow, so pretty I’d be compelled to lift a pinky when biting into one. Beautiful! wow so incredibly gorgeous! toying with the idea of making these as favors for my wedding. probably a tad bit too ambitious, but these are just stunning! I must give these a try. I live a minute away from the Orange Grove markets – definitely goung there this weekend to slurge on the edible flower goodness ! What popsicle mold did you use? Hi Schellie, I’m not sure what the name is, but I bought it on Amazon. Hope that helps. The edile flower popsicles are really very tasty. We made them following the steps that you mentioned. The steps are easy to follow.